The first USA torpedo, it was smaller and cheaper than the British Whitehead and required no air flask, a difficult thing for the USA to manufacture at the time. As it was flywheel powered, this torpedo did not leave a wake and could steer a straighter course than the Whitehead as its flywheel acted as a gyroscope. The flywheel was spun up by a small steam turbine mounted on the torpedo tube and drove two shafted propellers. The propellars were variable pitch and were designed to maintain a constant forward speed as the flywheel slowed. Thirty torpedoes were ordered in 1889 with twenty more being ordered in 1894. Placed in service in 1895 and removed in 1903. 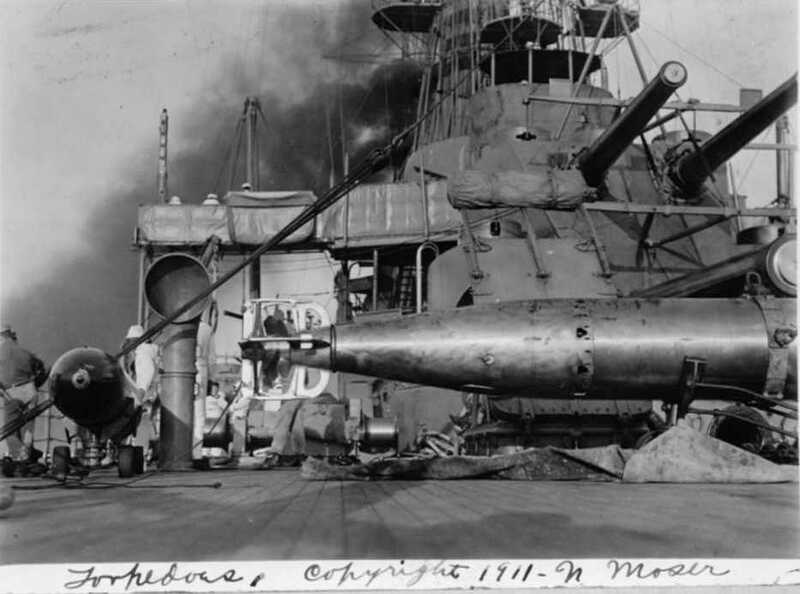 Difficulties and delays in production led the Navy to investigate the Whitehead torpedoes. 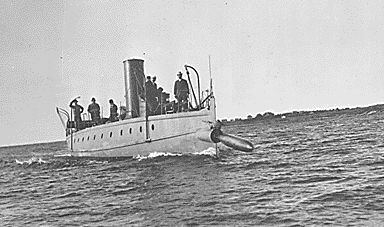 Torpedo Boat Stilletto launching a Howell torpedo about 1890. NARAL Picture. Air-flask (cold running) compressed air powered, three cylinder, radial Brotherhood pattern engines. The US Navy negotiated for the Whitehead torpedo patent rights with a license to build torpedoes in the USA being granted in 1891. The Navy awarded a contract to the E.W. Bliss company on 19 May 1891 for 100 torpedoes to an improved Whitehead design. Compared to the Howell, they were much better depth-keepers but less accurate. Somewhat confusingly, the Whitehead Mark 1 and Mark 2 torpedoes were built both in a 3.55 m (140 inch) version and in a 5.0 m (197 inch) version. The shorter ones were known as the "3.55 m x 45 cm Whitehead" torpedoes while the longer ones were known as the "5.0 m x 45 cm Whitehead" torpedoes. The Whitehead Mark 3 was built only in a 3.55 m (140 inch) version. The longer torpedoes and the Mark 3 were redesigned with letter codes in 1913, as described below. 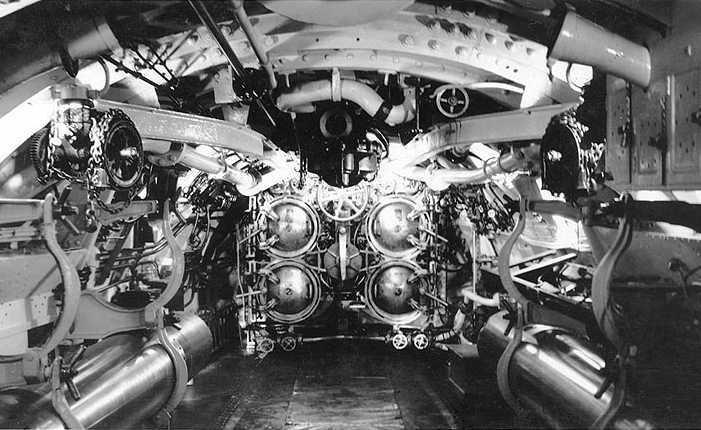 Torpedo Tube and Torpedoes on USS Oregon (B-3). Detroit Publishing Company Collection Photograph. Library of Congress Photograph ID LC-D4-20828. 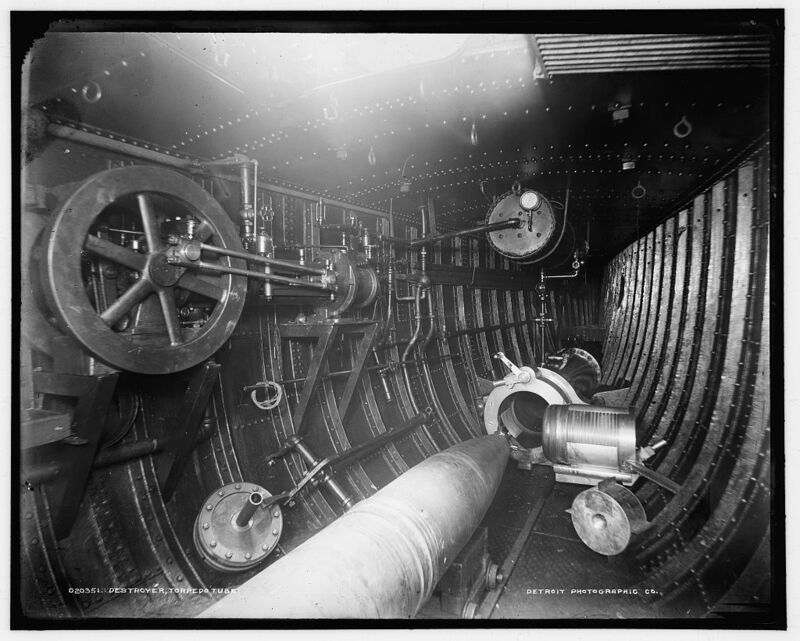 Torpedo Tube on USS Maine (B-10). Detroit Publishing Company Collection Photograph. Library of Congress Photograph ID LC-D4-20532. Manufactured by Bliss, these were a longer version of the basic design. Also known as the "5.0 m x 45 cm Whitehead" when first manufactured, it was designated as the "Type B" in 1913. After tests with the Whitehead Mark 3 torpedo (described below), the last forty of these "Long" Mark 1 torpedoes were given a gyro which had been patented by Ludwig Obry in 1896. This improved the horizontal deviation by 300 percent compared to the earlier Mark 1 torpedoes to +/- 8 yards (7 m) at 800 yards (730 m). However, this gyro proved very hard to maintain. Minor improvement of the Whitehead Mark 1. 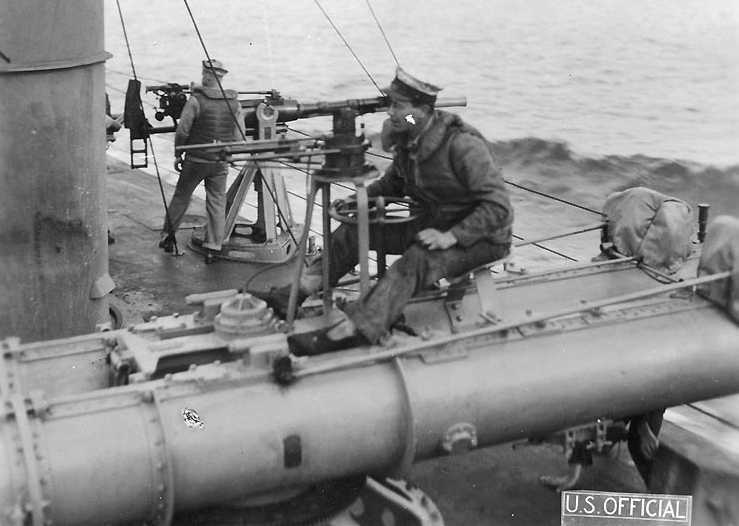 18" (45 cm) Torpedo on USN Torpedo Boat. Detroit Publishing Company Collection Photograph. Library of Congress Photograph ID LC-D4-20350. 18" (45 cm) Torpedo and Torpedo Tube on USN Torpedo Boat. Detroit Publishing Company Collection Photograph. Library of Congress Photograph ID LC-D4-20352. Developed from the 197 inch (5 m) Whitehead Mark 1, but used 20 percent more air pressure to obtain a significantly greater range. Designated Type C in 1913. 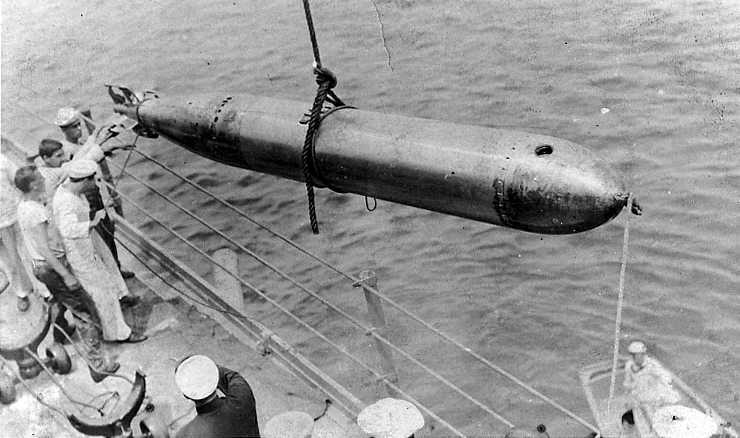 Unidentified Torpedo afterbody on USS Connecticut B-18 circa 1909. U.S. Naval Historical Center Photograph. # NH 63012. 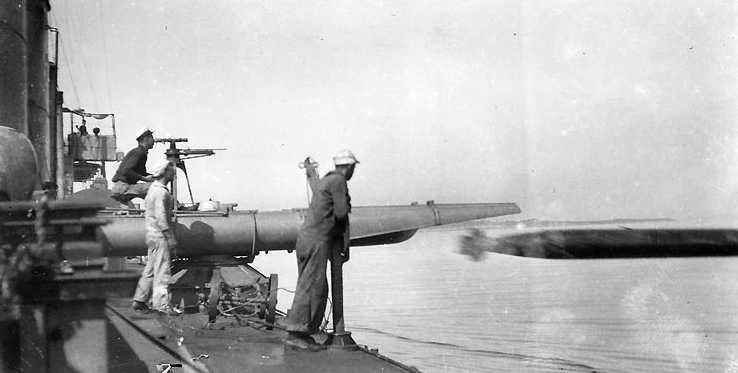 This was the first US torpedo to be equipped with a gyro which greatly improved accuracy, otherwise it was a minor improvement of the Whitehead Mark 2. The A through D class submarines originally fired this torpedo, but the C and D classes were modified around 1912 to use any of the longer, more powerful 204 inch (5.2 m) torpedoes. Whitehead 18" (45 cm) Mark 3 torpedo being launched at Newport Torpedo Station in 1894. In the background is USS Cushing D-1. U.S. Naval Historical Center Photograph # NH 82831. 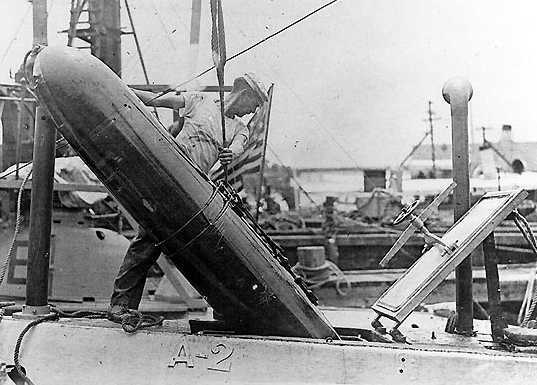 18" (45 cm) torpedo being loaded into USS A-2 (ex-Adder) SS-3 about 1912. U.S. Naval Historical Center Photograph # NH 90188. 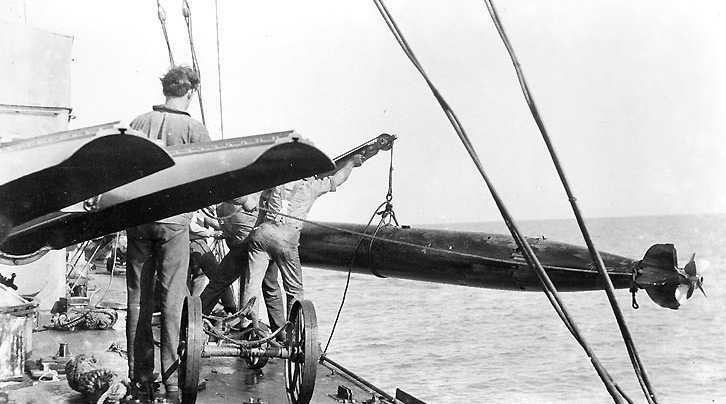 Hoisting a torpedo aboard USS Kansas B-21 about 1909. U.S. Naval Historical Center Photograph # NH 82775. F.M. Leavitt was a Bliss engineer. This design was a substantially improved torpedo, the first to use air heating which gave it much greater range than the compressed cold-air powered Whitehead. This new torpedo had a two stage, single wheel turbine set perpendicular to the propeller shaft to in an attempt to avoid torque problems, but the design still produced an unbalanced torque and unwanted gyroscopic effects. These tended to make the torpedo roll. Used a single 4-blade propeller. 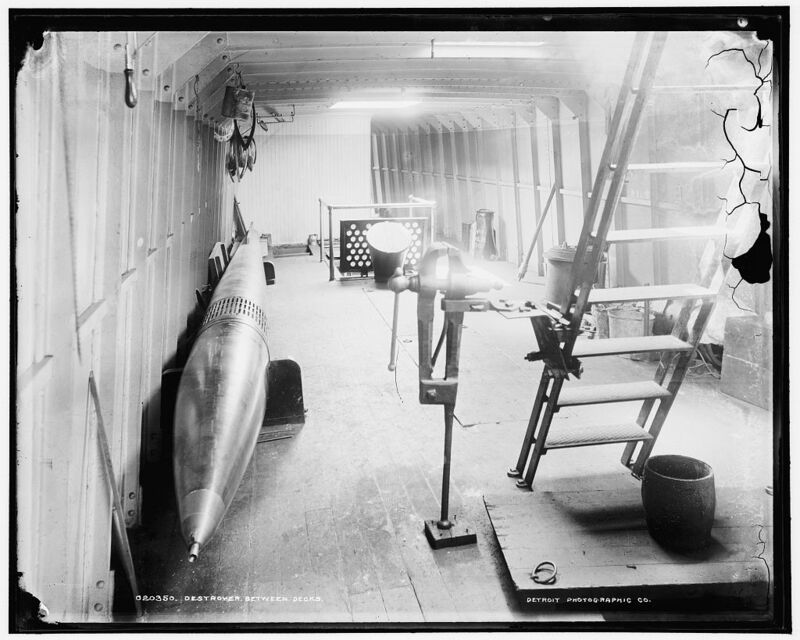 The original Bliss-Leavitt Mark 1 was an experimental torpedo with two built in 1903 but not issued to the fleet. 200 more were ordered on 4 November 1905. Fifty additional torpedoes of the Mod 1 improved design were ordered on the same date. By 1912 all Mark 1 and Mark 1 Mod 1 torpedoes had been converted to the Bliss-Leavitt Mark 1 Mod 2 standard (no details available) and then redesignated as Torpedo Mark 1 in 1913. Introduced two countra-rotating turbine wheels which drove contra-rotating propellers to overcome the unbalanced torque of the Mark 1. This propulsion system eliminated the rolling problem at a slight cost in range and speed. This propulsion arrangement was used on all subsequent USA torpedoes until after World War II. Designated as Torpedo Mark 2 in 1913. Torpedo at the Newport Torpedo Station, Rhode Island circa 1908-1919. Photograph from National Photo Company. Library of Congress Photograph ID LC-F81-2684. Basically a Bliss-Leavitt Mark 2 with increased range. 208 ordered in 1909 and 1910. Designated as Torpedo Mark 3 in 1913. Torpedoes aboard a Virginia Class battleship in 1911. Note the contra-rotating propellers. Photograph copyrighted by N. Moser. Library of Congress Photograph ID LC-USZ62-103266. First USA torpedo designed specifically for submarines. Twenty-one inch (53.3 cm) torpedoes were too heavy and too bulky for the submarines of the time. For that reason, this torpedo was designed as a scaled down version of the Bliss-Leavitt Mark 3. Designated as Torpedo Mark 4 in 1913. Used by C and D class submarines. First torpedo in US service that was built by a foreign company. Manufactured by the Whitehead facility in Weymouth, UK. Later, this design was manufactured under license by the US and became the first torpedo built at the Newport Facility. First major improvement to the original Whitehead engine in that a heater was used for the air feed, which increased the range by a factor of five. This was the first US torpedo that could be set for any one of three speeds. 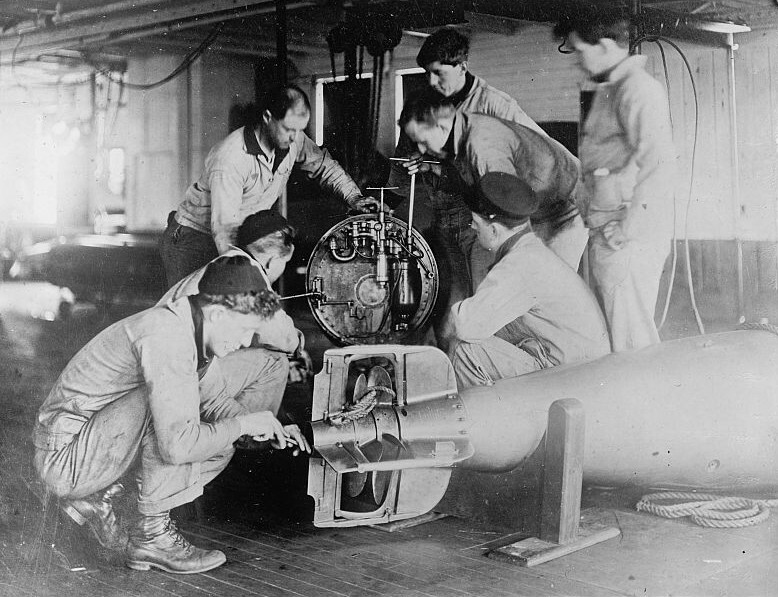 However, the speed had to be set before the torpedo was loaded into the tube, which limited its tactical flexibility. This was the last piston engine used in USN torpedoes until the Mark 46. Replaced by the Bliss-Leavitt Mark 7. 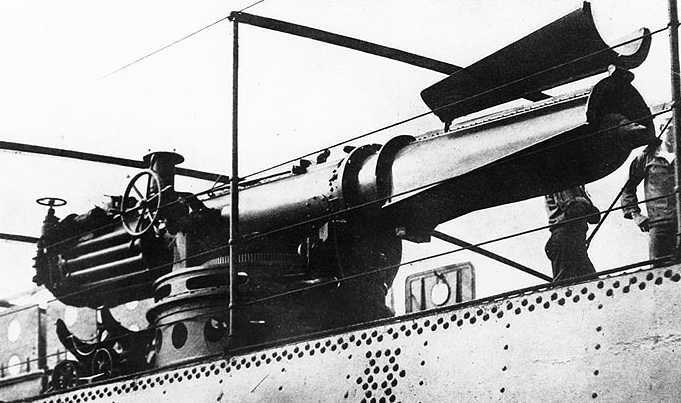 18" (45 cm) Torpedo Tube on USS Flusser D-20 about 1916. 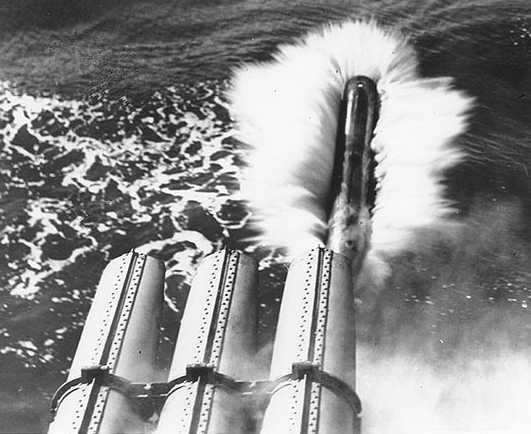 Note the hinged "spoon" on the end of the tube, which helped to guide the torpedo as it cleared the tube. U.S. Naval Historical Center Photograph # NH 79484. The Bliss-Leavitt Mark 6 introduced a new turbine configuration in which the wheels were horizontal. This configuration has been the most common choice for USN torpedo turbine systems ever since. 100 were ordered in 1909. 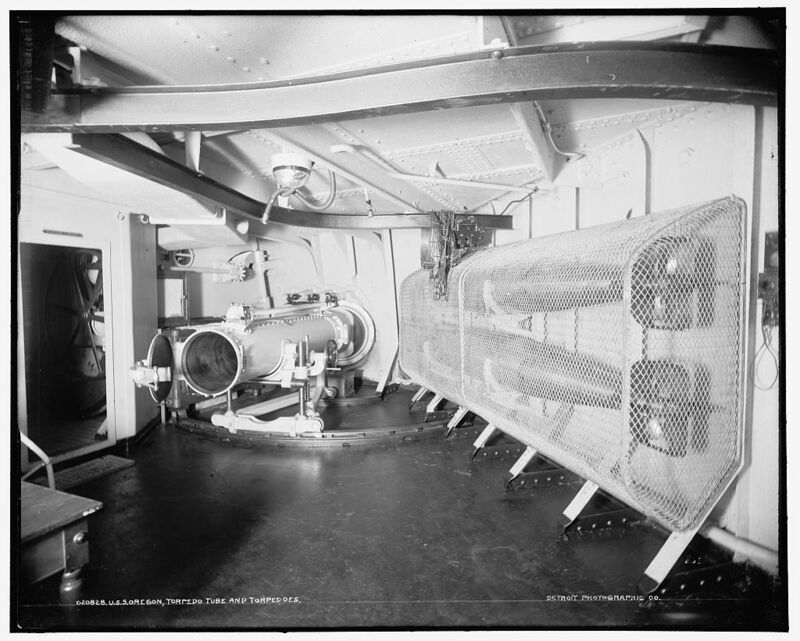 Bow torpedo room on Submarine H-5 (SS-148) about 1919. Note the two torpedoes in the lower storage racks. U.S. Naval Historical Center Photograph # NH 4674. 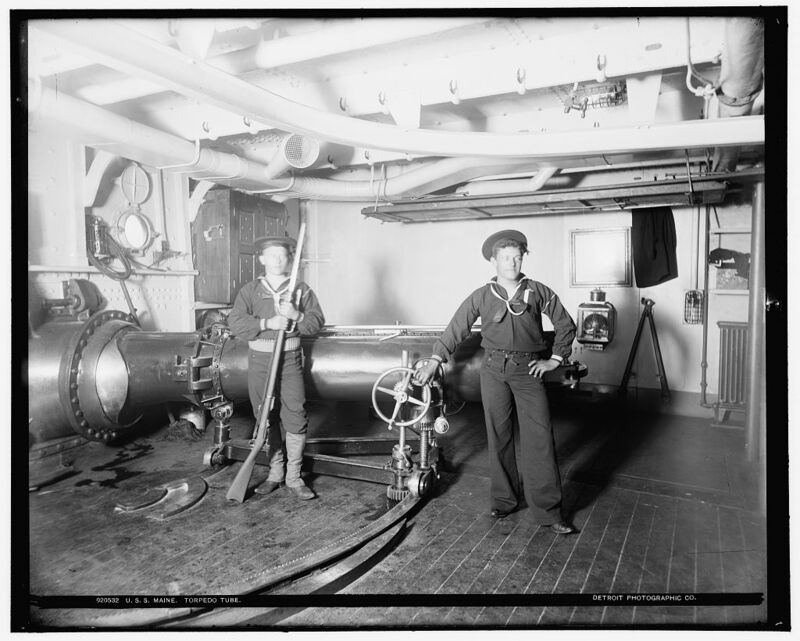 Firing a torpedo from USS Walke (D-34) in 1914. U.S. Naval Historical Center Photograph # NH 92539. U.S. Naval Historical Center Photograph # NH 92541. First wet-heater (water spray into combustion chamber) torpedo in the US Navy. 240 ordered in 1912. Still being used by old submarines during World War II. Some Mark 7 torpedoes were modified for use by aircraft (see below). 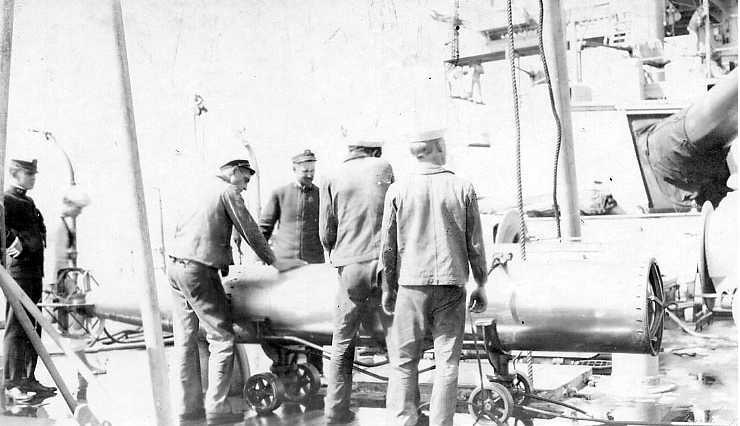 Loading a torpedo aboard K-8 (S-39) about 1915. U.S. Naval Historical Center Photograph # NH 100767. Smaller version of the Mark 7 developed to fit the shorter torpedo tubes on old submarines. Never deployed for that purpose, but used during early aircraft tests. After a series of drops with dummy torpedoes, on 14 July 1919 a live Type D was successfully launched from an R-6L Navy floatplane. 43 more Type D torpedoes were launched from planes during the next 12 months. Dummy Mark 7 Type D being dropped from a Curtis R-6L sometime during 1919. US Navy Photograph. 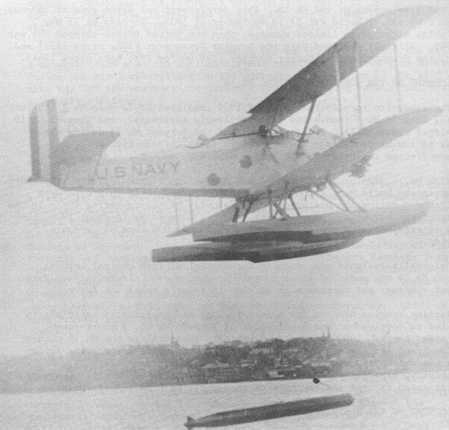 The first experimental USN aircraft drops with Mark 7 torpedoes were made in May 1920 at the Naval Air Station, Anacostia, Maryland, using two Mark 7 Mod 5 torpedoes. Air speed for these drops is believed to have been 50 to 55 knots at altitudes of 18 and 30 feet (5 and 9 m). It was found that the torpedo dropped from 30 feet (9 m) was badly damaged while the one dropped from 18 feet (5 m) was not. Torpedoes were then modified by strengthening them for shock, installation of exploder safety pin and attachment of a nose drogue. The first mass torpedo practice against a live target was conducted off the Virginia capes on 22 September 1922 by 18 PT aircraft of Torpedo and Bombing Plane Squadron One. The squadron attacked the designated target, Arkansas (BB-33), which was one of a formation of three battleships which were maneuvering while running at full speed. The attack lasted over a 25 minute period during which time the aircraft approached the ships from both sides and released 17 Mark 7 Mod 1 "A" torpedoes at distances of 500 to 1,000 yards (450 to 900 m). Eight hits were made on the designated target. Subsequent analysis emphasized the artificialities which prevented the practice from demonstrating combat capability of either the surface or air units, but the outstanding fact demonstrated was that torpedoes could be successfully launched from aircraft and be made to run straight. During trials in 1924, Mark 7 torpedoes were successfully launched from DT-2 torpedo planes at an air speed of 95 knots and from an altitude of 32 feet (10 m). Aircraft torpedoes of this type were eventually replaced by the Mark 13. 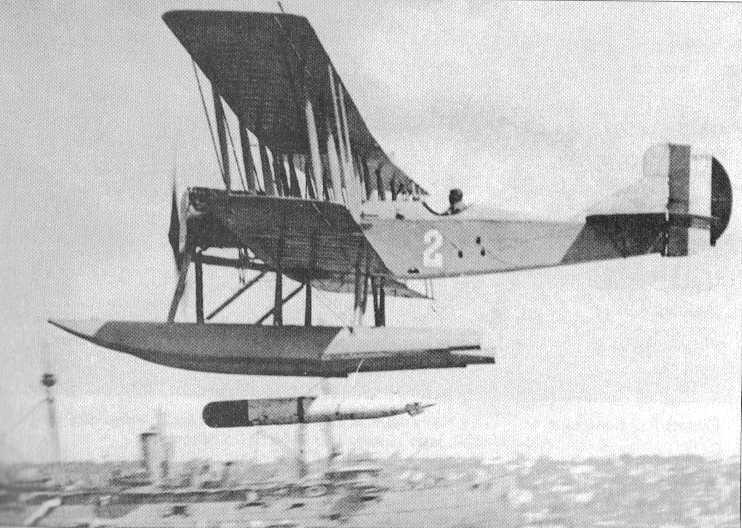 Aircraft version of the Mark 7 being dropped by a DT-2 torpedo plane during trials in the mid-1920s. Note the longer length compared to the Mark 7 Type D above. First 21" x 21' (53.3 cm x 6.5 m) USN torpedo. Later versions starting in 1923 - Mod 5, 6 and 8 - had much larger warheads. These torpedoes were still being used on older destroyers and PT boats during World War II. It is possible that a higher speed setting was available for the torpedoes issued to PT boats. This torpedo was supplied to Britain for use on Lend-Lease Destroyers in 1940. Torpedoes issued to Britain are listed as having a warhead of 380 lbs. (172 kg) TNT and a range of 14,000 yards (12,800 m) at 27 knots. Torpedoes intended for USS Farragut DD-300 and USS Thompson DD-305. Picture taken about 1925. U.S. Naval Historical Center Photograph # NH 82563. A short torpedo developed for the submerged tubes on battleships. Originally known as the Bliss-Leavitt Mark 3 Mod 1. Used by "R" and "S" class submarines in World War II. Last torpedo built by Bliss. Last torpedo designed by Bliss and manufactured by the Naval Torpedo Station at Newport. Still used by "S" class submarines during World War II. First torpedo entirely developed by Newport Station. It appears to have been of heavier construction than previous torpedoes. USS Milwaukee CL-5 launching a torpedo ca. 1925. U.S. Naval Historical Center Photograph # NH 85126. A modified Mark 11 with the only difference being a reduction in the high speed setting to improve reliability. Approximately 100 manufactured. 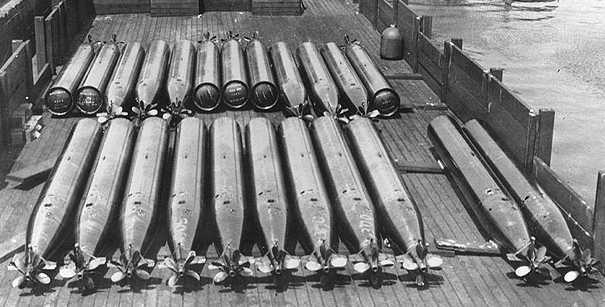 "A Brief History of U.S. Navy Torpedo Development"